Do not forget to check the 'Stop Press' posts. Below is a detailed report of the Service. 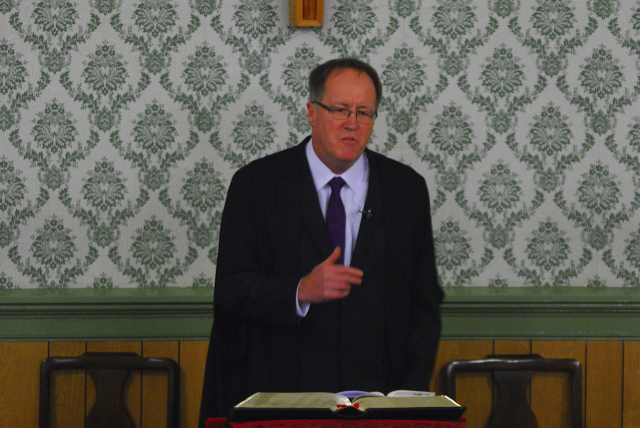 19th March 2013 at 7:30 p.m.
On behalf of the members of Hamilton United Reformed Church the minister, the Rev’d. Derek Corner bid the congregation of some 160 people welcome. the First Secretary, Zambian High Commission, Steward Nchimunya, and Ms. Beatrice Mukuka, the Personal Assistant to the High Commissioner of Zambia. However, the Rev’d. Mitchell Bunting, descendant of Mary Livingstone’s family, was present. Due to serve weather conditions the former minister of the congregation, the Rev’d. Stanley Britton and his wife, were unable to be present. A few apologies were recorded, mainly because of the service being held in Westminster Abbey, laying a wreath on David Livingstone’s tomb. A gracious message had also been received from her Majesty the Queen. 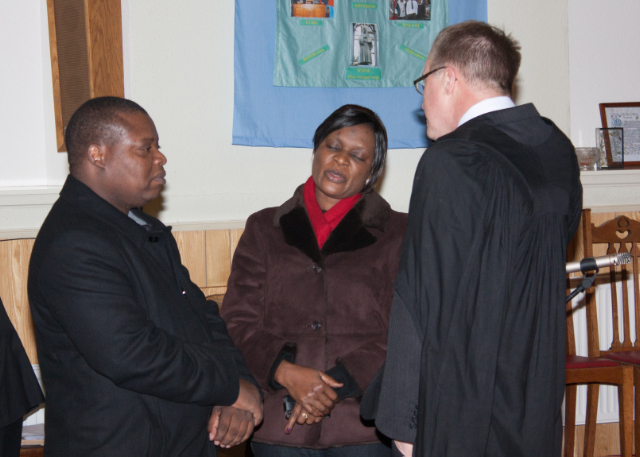 The minister welcomed and introduced those participating in the Service. Rev’d. Fr. Willy Slavin of St. Simon’s RC Church, Partick. Rev’d. John Thomson of the Old Parish Church, Hamilton, who had the good fortune to be baptised by his Aunt, the Rev’d. Jean Thomson, one of the first women ordained as a minister, being a minister of the Congregational Union of Scotland. and the guest preacher, Mr. Lawrence Moore, who is Director of The Windermere Centre, the United Reformed Church resources and training centre in the Lake District. The provost was invited to say a few words before the service. 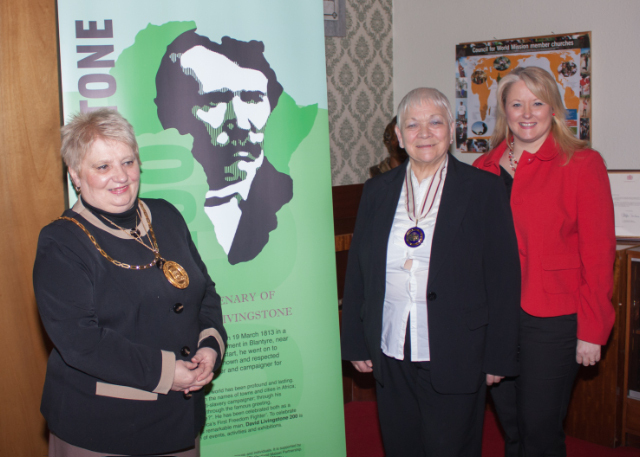 She welcomed everyone to South Lanarkshire and brought greeting to the members of the Church,; speaking of the legacy of Livingstone in Blantyre and Lanarkshire. 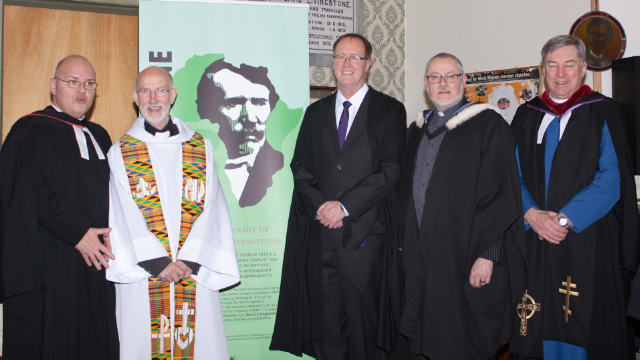 Why are we celebrating David Livingstone in this United Reformed Church here tonight? Blantyre was Livingstone’s birthplace, and his local Parish Church appropriately celebrated that village’s son on Sunday – to me a lovely thought that the Presbyterian Church of Scotland celebrated the life of the nearest that Scottish Congregationalism has ever come to having a saint [at least if his fame is to be gone by] – BUT here in Hamilton was his spiritual home. He worshipped during his childhood and teenage years in the Independent Church which eventually settled as St. James’ Congregational Church in Auchingramont Road. His parents left that congregation and are listed amongst the first ten founder members of this Church, once known as an Evangelical Union Church. In 1896 the Congregational Union and the Evangelical Union merged, so the two churches became part of the same denomination. In 1966, during Mr. Britton’s ministry, St. James’ Church closed its building and merged with its sister congregation, to form Hamilton Congregational Church, using this present building. In the late 1990s there was movement within the then Congregational Union, which eventually led to some of us merging with the United Reformed Church; and some transferring allegiance to the Congregational Federation. As a combined congregation we rejoice in two particular historical figures; Keir Hardie having spent some of his formative years attending worship this building – and the man whose memory we honour tonight Doctor David Livingstone. From the rising of the sun to its going down, let the name of the Lord be praised. The congregation shared the peace of Christ our Lord. We come to celebrate the life and witness of David Livingstone; doctor, explorer, missionary, man of faith and of great courage and tenacity. We come to rejoice in a son of our independent church tradition in Scotland. But we also come to look forward, to see what we can learn of him for our mission together in Scotland today. Our opening praise is one of David Livingstone’s favourite hymns. The second praise was one of the first hymns which Livingstone translated for the African people to whom he sought to witness. Fr. Slavin began by quoting the Latin inscription on Livingstone’s tomb. [Few, if any, of the congregation followed the words he spoke.] He then outlined the story of Livingstone being helped in learning Latin, required to train in medicine, from a young boy Daniel Gallagher. Later Gallagher became a priest and founded St. Peter’s Church, now St. Simon’s RC Church, Partick, Glasgow. He spoke of that congregation’s annual 15 mile walk from Partick to Blantyre, the walk Livingstone did on a regular basis to say one penny cart fare. He then read the portion of the psalm. The sermon was delivered by Lawrence Moore. “Lord, send me anywhere, only go with me. Lay any burden on me, only sustain me. So we go forward and our closing hymn takes us back out into the world – to serve Christ in the world of today, and tomorrow, and beyond – our lives enriched by the example of those, who like David Livingstone and so many other have gone before us, giving us examples of faith and service. go in peace, go in joy, go in love. There was a retiral offering donated to David Livingstone Memorial Trust. A reception followed in the Church Hall, with the celebration cake being cut by the Provost. 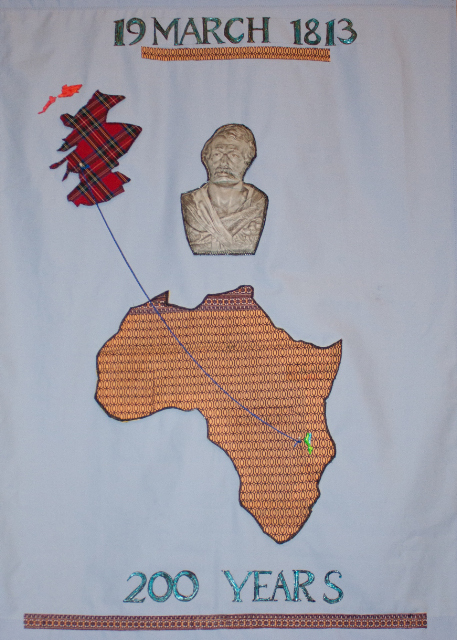 An archive of events held during the Bicentenary year has been created and is located in the sanctuary as part of the David Livingstone display. A collection of newspaper articles is on display in the Church Hall. 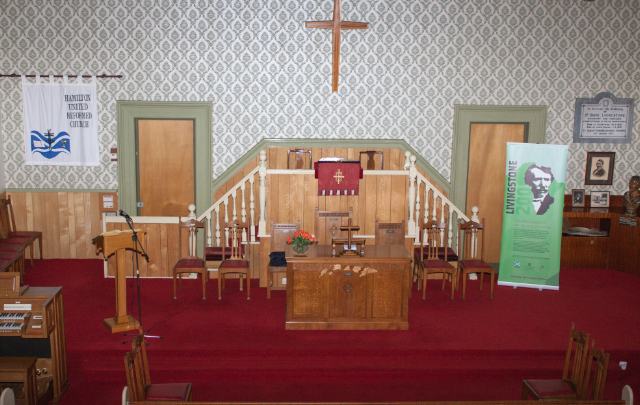 Welcome to the presence of the Hamilton United Reformed Church on the Web. Use the menu above the sliding images to discover more about us, our history, and the things we do in the present. Hamilton URC works in partnership with East Mains URC and Righead URC as part of the East Kilbride and Hamilton Joint Pastorate - links below for our partner congregations. – Placebook Scotland – Scottish photographs, poetry, etc. The Calendar Page at the start of the Diary Pages contains summary information for at least three months ahead. All photographs (c) Hamilton URC. The Sacrament of the Lord's Supper is celebrated on the fourth Sunday of each month, to which are welcome 'all who love the Lord'. Tea and coffee are served in the hall after each service.